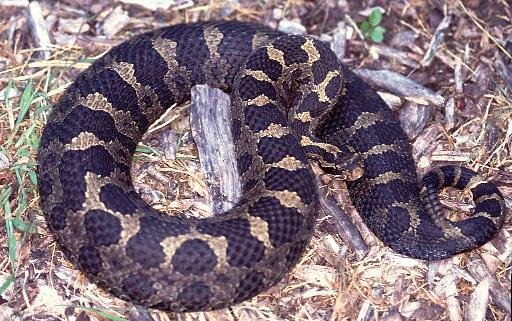 Eastern Massasauga is a poisonous species of Pitviper snakes mainly found in different regions of United States. These rattlesnakes are also known as Massasauga, Black Snapper, Black Massasauga, Gray Rattlesnake, Ground Rattlesnake and Pygmy Rattler. They are often confused with some non-venomous snake species like the eastern milk snakes and fox snakes. Length: Adult snakes of this species grow somewhere between 18 inches and 30 inches (45 cm and 75 cm) in length. Color: The base color or ground color ranges from grey to tan with large black or brown spots covering the center of their dorsal side. The sides of these snakes are covered with three rows of small alternative spots. Young snakes of this species have similar patterns like the adults but are much paler. Head: They have a small triangular head with two heat-sensing pits situated between the eyes and nostrils. 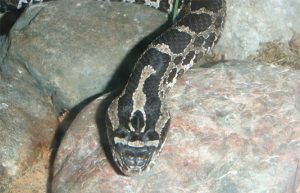 They are the only Ontario snakes to have vertical pupils. Rattle: Like other rattlesnake species, these snakes have rattles situated at the tip of their tail. They can make a clattering sound using these rattles. 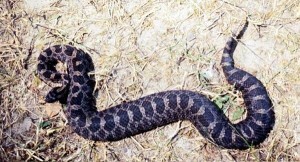 Young Massasauga snakes have a single yellowish button at the very end of their tail which grows as the snake grows up. They can be found in different regions of the United States. The range of distribution includes southwestern regions of Ontario, New York, Michigan, southeastern Arizona and northern Tamaulipas. Isolated populations are found in different places of Mexico including Nuevo León, Coahuila and Chihuahua. They live in marshes, swamps and other wetlands during spring. During summer they move to drier areas like open grasslands and meadows. They usually live at elevations below 1500 meters. This species prey on various types of mammals, amphibians and insects. They eat small lizards, rodents, frogs and even small snakes. Juvenile Massasauga mainly feed on small reptiles. They are usually active during daytime (diurnal) except on exceptionally hot days. These snakes are believed to have much slower reflexes than other rattlesnakes. Like other rattlesnake species they produce a rattling sound by vibrating their rattles. This sound acts as a warning for other nearby animals. They usually stay hidden under rocks, logs and piles of brush or in abandoned burrows of small mammals and rodents. These venomous snakes may bite humans if disturbed or provoked. Natural predators of this species include eagles, loggerhead shrikes, bullfrogs, herons, weasels and coyotes. These Pitviper snakes have many adaptations that help them to survive in their natural habitat. They use their hollow fangs to inject hemolytic venom in the body of their prey. This venom breaks down the red blood cells and eventually subdues the bitten animal. This helps the snake to easily swallow the prey. Their black brown coloration helps them to stay camouflaged making it hard for their predators to find them. They are known to reproduce during April and May. The eggs of this ovoviviparous species develop and hatch in the body of the female snakes. Each litter contains somewhere between 5 and 15 young snakes. This species reproduce every year or in alternate years. 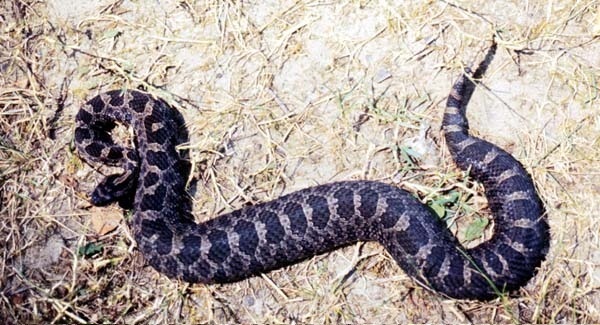 The female Eastern Massasauga Rattlesnakes leave the young ones after their birth. The young snakes grow up by themselves depending on the amount of food available. They hide under rocks and tree trunks to avoid predation. The average lifespan of this species is 18 years; however some specimens have been known to live up to 20 years in captivity. The Eastern Massasauga Rattlesnakes defend themselves from the sharp teeth and claws of their prey with the help of their venom. The venom of these snakes contains specialized digestive enzymes. These enzymes disrupt the blood flow preventing the clotting of blood in the body of their prey. This results in severe internal bleeding which subdues the small animal ultimately causing its death. The venom of these snakes usually cannot kill humans. However, lack of proper medical attention has caused death in two instances in Ontario. These rattlesnakes remain inactive with low metabolism and body temperature from October through April. Hibernation does not occur in communal dens like many other venomous species. They are known to hibernate alone or in small groups under sphagnum hummocks or in burrows. They usually shed their skin 3 to 5 times every year. One new segment or button is added to their rattle each time they shed. Due to this reason the number of their rattle is equal to the number of times they have shed their skin. Their name “Massasauga” originally derives from a Chippewa word, which means “great river mouth”. It probably refers to the fact that this species prefers watery habitats. They cannot vibrate their rattles to produce very loud sounds. Due to this reason they can only be heard from close distances. These snakes are usually shy in nature avoiding humans as much as possible. They are the only known venomous snake species found in Ontario and Michigan. This snake species is listed in the “Least Concern” category by the IUCN. They are also not mentioned in the United States federal Endangered Species Act. However, they are considered to be an endangered species in many states in the southwestern US and northern regions of Mexico. Their population in Ontario and Canada is also becoming threatened due to habitat loss. Both the Committee on the Status of Endangered Wildlife in Canada (COSEWIC) and the Committee on the Status of Species-at-Risk in Ontario (COSSARO) have declared them to be a threatened species. This rattlesnake species is protected by several federal and state laws in different states of the US as well as Canada. They have made it illegal to collect and keep this species as pet in order to conserve their remaining population. 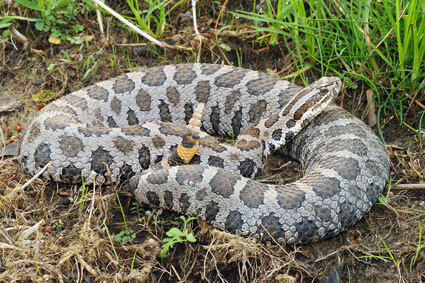 Eastern Massasauga Rattlesnakes are an amazing species with their gorgeous appearance and interesting habits. It is the duty of the humans to save them from disappearing from the face of the earth.